Sign up now to become an eCribbage PRO Member! What do PRO members get at eCribbage? Why should I become a PRO member? What if I don't become a PRO member? Why did eCribbage have to add PRO memberships? What kind of discounts can I get with my PRO membership? Is there a way to get all the features without paying? What new features are coming for PRO members? What do eCribbage PRO Members get? participate in raffles for prizes, and get access to ANY new feature added to eCribbage. tournament hosting, and new game development. smoothest quality of play for everyone! Please visit the \"What kind of discounts can I get\" Section. Best Regards, and thank you very much for your support! You can try to win a free membership by winning a monthly tournament or referring new paying players. As you have probably noticed, there are a lot of new faces at eCribbage.com. Because of all the new players, the servers were getting bogged down. upgrades on the server and client side. all the fun and cool features completely for free so I had to add PRO memberships. 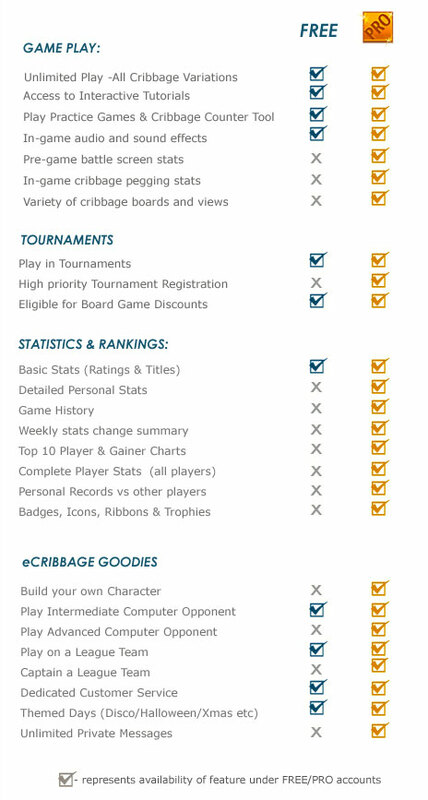 constant improvements and updates to the best cribbage community out there! in-game quests to achieve prizes, a hall of fame screen, and club play. of membership free when they sign up to become a member. your 30 day free trial time frame. each year for however long you renew. at eCribbage a lot, we want to give a discount for a family membership. You can then apply this discount with the other discounts above. #1. for every new paying member you refer to eCribbage.com, You get an extra free 3 months. Let's say you referred 8 new paying members to eCribbage, you will get 2 free years! Make sure when the new player signs up they write your name in the \how did you hear about us\ box. #2. we will have occasional tournaments where the winning player gets a free membership for a year. So if you can win one of these tournaments, you can get a free membership! Yes, for every new paying member you refer to eCribbage.com, You get an extra free 3 months. Make sure when the new player signs up they write your name in the "how did you hear about us" box.